“No barriers, no borders, we all just need to coexist,’’ that was the defiant and endearing message of warmth, solidarity, friendliness, kindness and of course undivided and all-consuming love from American singer-songwriter and musician Katy Perry who is rumoured to have an estimated net worth of $280 million dollars. In a move of utter defiance against Islamic Terrorism, Katy Perry has announced to her just over 99 million “Katycats” on Twitter that she will be bravely travelling to the Syrian Arab Republic in Western Asia to put on a spectacular display of peace, harmony and a whole lotta “Bon Appétit”. The decision to perform in Syria is bound to raise a lot of questions, especially from concerned and anxious fans of the “Swish Swish” singer coming so soon after her fellow pop star and feminist Ariana Grande announced that she is set to perform a special tribute concert in dedication for the 22 Arianators, who lost their lives at her concert in Manchester, at the hands of home-grown Islamic Terrorist, Salman Abedi. Katy Perry had been forced to defend her earlier comments following the Manchester terror attack on Monday. Her clarifications came after she was condemned by right-wing critics for suggesting that people coming together would solve violence and was accused of “not respecting American culture”. “Whatever we say behind people’s backs, the Internet can be a little bit ruthless as far as fan bases go, but I think that the greatest thing we can do is just unite and love on each other”. “No barriers, no borders, we all just need to coexist” she continued. While her response was entirely well-meant, it didn’t go down well with everybody. Former Navy Seal Carl Higbie, was one of those who had a blunt message for the pop star about her comments. “This woman has said we need to hug it out. Go to hell, Katy Perry” Higbie told Fox News on Thursday. Well of course Perry took that attack to heart and her decision to perform in the Middle East has now proved a lot of right-wing commentators and Fox contributor wrong, most actually praising Perry for not being just another “left-wing luvie-virtual signalling celebrity”. In a time when a recent US-led coalition air raid killed at least 35 civilians, including many women and children, Katy’s appearance at the war-torn continent will put a lot of smiles on the faces, that are normally gloomy and covered in rubble and dust. Perry is currently in the midst of intense rehearsals and is pencilled in to travel to Syria in early September. Katy’s management team have confirmed that they are in the “early stages” of talks with president of Syria, Bashar al-Assad, who has reached out to Perry’s team to secure backstage VIP passes for him and his family. With members of the Islamic State and al-Assad opposed rebels, also rumoured to be in attendance, there is set to be a lot of actual fireworks from the “fireworks” singer. Now of course, this is just pure hypothetical and imaginary and in the fabricated world of pretend and make-believe left-wing luvie celebrities, the idea of stepping out of a gated multimillion dollar mansion and stepping into the real world with the unpolished reality of suicide bombings, knife crimes and mass migration is a gig that these out of touch pop stars are not willing to perform for (even for the extra bit of inch column, publicity and endorsement from Hillary Clinton). So instead, expect more morally superior and humanitarian tweets encouraging the common folk to give Jihadists a cuddle and to open your doors and let in the influx of refugees and adopt an Afghanistani baby. 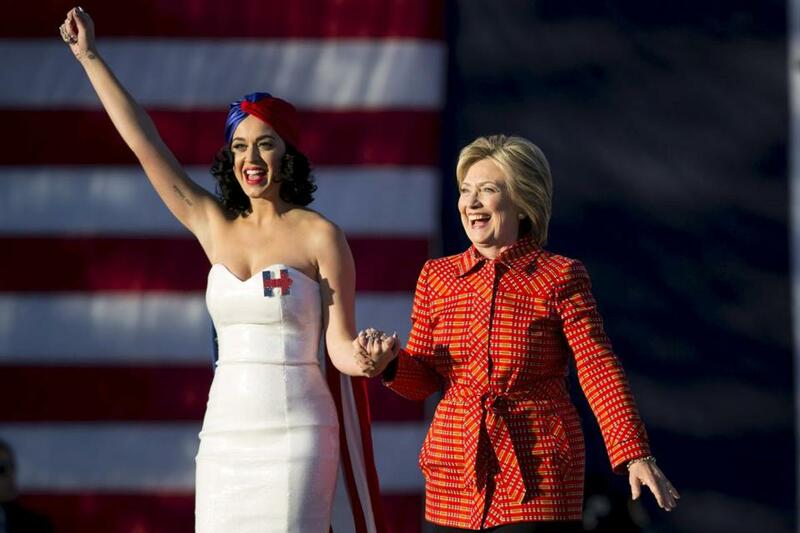 So, is Katy Perry going to be performing in Syria? Well, quite frankly you have more chances of a pretentious heterosexual pop star using homosexuality and lesbianism as a ploy and marketing tool mechanism, in order to appear outrageously “cool” and “edgy”, whilst selling millions of records to impressionable and easily influenced teenage girls in the process then that ever actually happening. Oh wait….. Previous Article← Is Theresa May The Reincarnation Of Jesus?